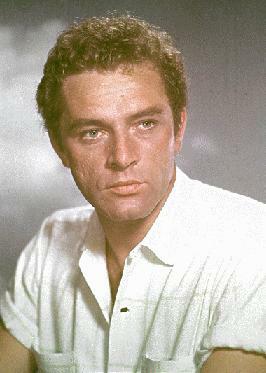 Well my favorite actor I think is Richard Burton but a little bit far from Humphrey Bogart, Paul Newman and Montgomery Clift he's the best for me even though I've seen horrible movies in his filmography but his presence gave something to those like "Boom", "Doctor Faustus" and 2 or 3 more. His life full of excesses and his great charisma, besides of his grandiose performances in the cinema and the theatre gave to him a place between the legends of Hollywood. And educated voice was his best weapon he used it in a magnificent way, his romace with Elizabeth Taylor in someway helped him in his career and for that reason people gave account of his great talent, though many critics said he wasted his talent, maybe this will sound odd, alcohol gave him another help, talking about acting and of course I'm the greatest fan of that wonderful couple they made, a movie with them it's something that I'll never miss. Want to see more pictures of Liz Taylor and Richard Burton go to Gallery 5. A dialogue from "The rains of ranchipur"
Another video from "Boom" also in my weekly videos section. "The V.I.P.s" in my videos section too. "The robe" in Quicktime video also.